Men in TT are at risk of having prostate cancer and lung cancer. 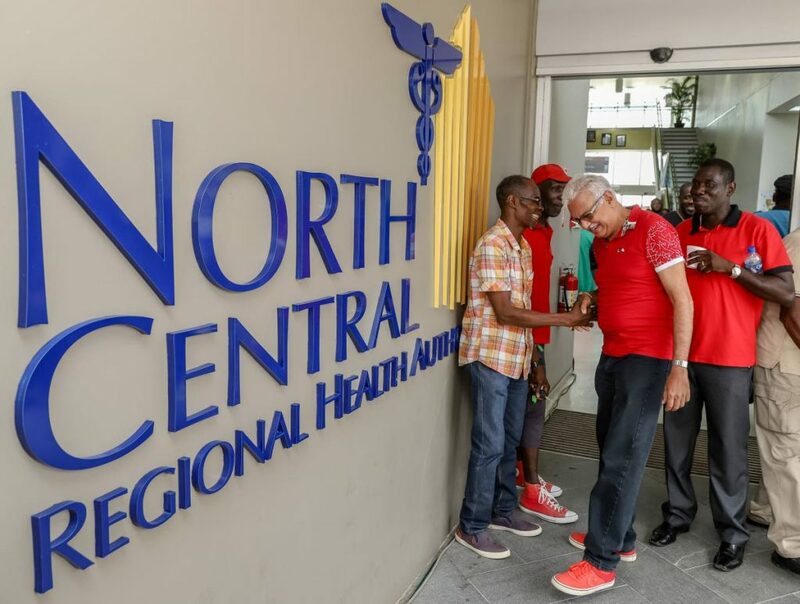 The Ministry of Health has taken on the issue of non-communicable diseases (NCDs) and yesterday marked a revolution of how TT’s health sector treated with NCDs (diseases that are not easily transmitted from one person to another) especially prostate cancer in men. 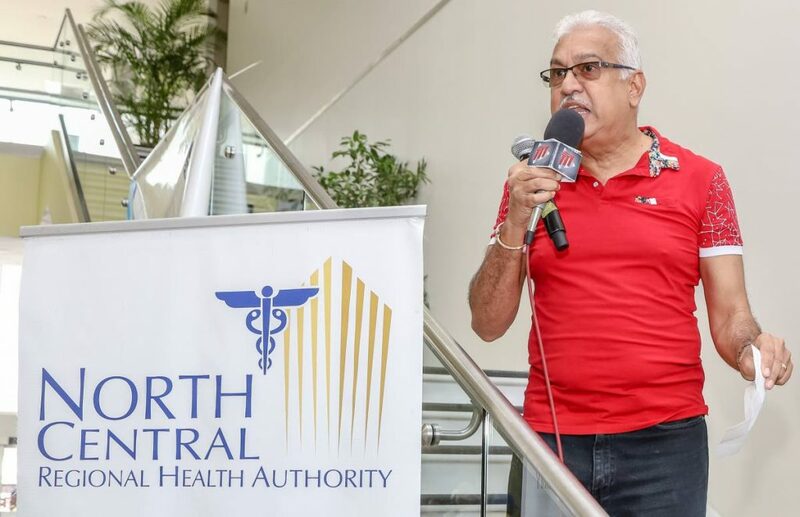 This was one of several messages given by Minister of Health Terrence Deyalsingh at the Men’s Wellness Clinic hosted by the North Central Regional Health Authority (NCRHA) yesterday at the Colposcopy Centre, Mt Hope Women’s Hospital, Champs Fleurs. NCRHA staff members were greeted by a large number of men as the clinic was opened at 9 am. "In TT we have an Indo- and Afro-based population. 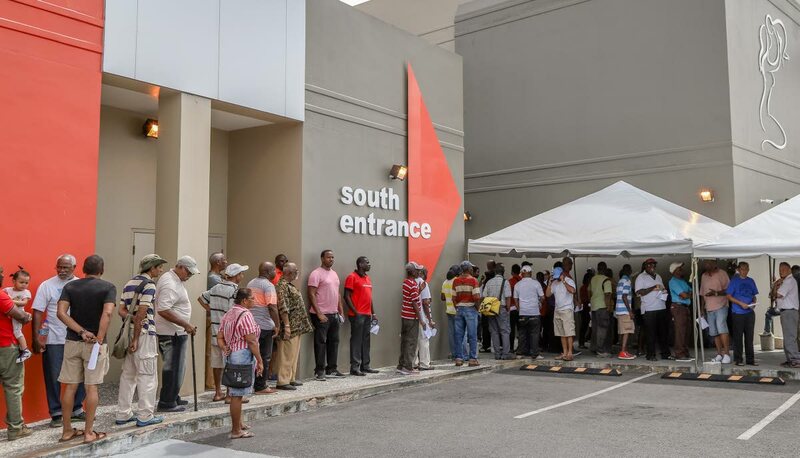 Afro-Trinidadian males are more prone to prostate cancer and we recently had a team from Palm Springs and what we found was that for a small amount of African males there is a particularly aggressive form of prostate cancer,” said Deyalsingh as he addressed the media. Minister of Health Terrance Delyalsingh is greeted and thanked by members of the public on having the Men's Wellness Initiative Clinic put on by the ministry at the Colposcopy Centre in the Mt Hope Women's Hospital yesterday. “So we want to target the males of African descent to understand that they are more predisposed to prostate cancer than other racial groupings in TT. While we target all men I want the message to go out that the Afo-Trinidadian males need to be more careful and get their prostate specific antigen (PSA) levels tested so he understands whether or not he needs intervention.” The PSA is a chemical release from a normal as well as overactive prostate gland. Minister of Health Terrance Delyalsingh addresses members of the public at the Men's Wellness Initiative Clinic put on by the ministry at the Colposcopy Centre in the Mt Hope Women's Hospital yesterday. 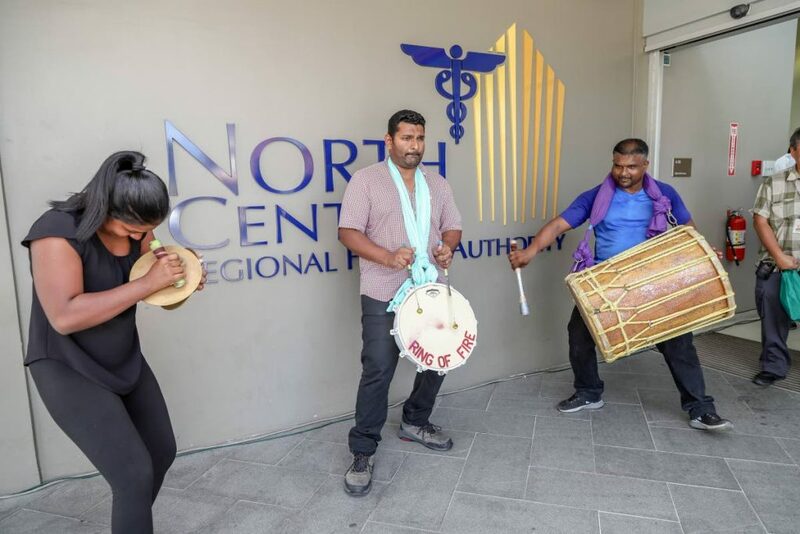 San Juan Young Stars Tassa Group performs at the Men's Wellness Initiative Clinic put on by the Ministry of Health at the Colposcopy Centre in the Mt Hope Women's Hospital yesterday. 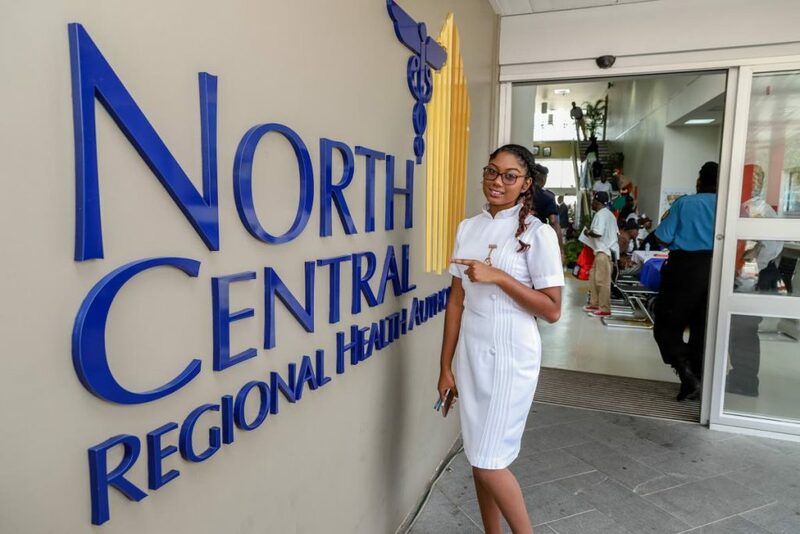 Registered nurse Shenelle Sherisha Rajbir a recent UWI graduate assisted in welcoming and directing men to register in addidtion to running tests at the Men's Wellness Initiative Clinic put on by the Ministry of Health at the Colposcopy Centre in the Mt Hope Women's Hospital yesterday. He said people usually sought medical attention when they started presenting symptoms of cancer which could be in stage one, stage two or the extreme stages which, therefore, became difficult to manage. “What we want to do is catch people at stage one or at the precancerous stage. Therefore, it is easier to treat, less expensive on the state and your chances of living longer and not dying from prostate cancer are better, that is what we want to achieve. 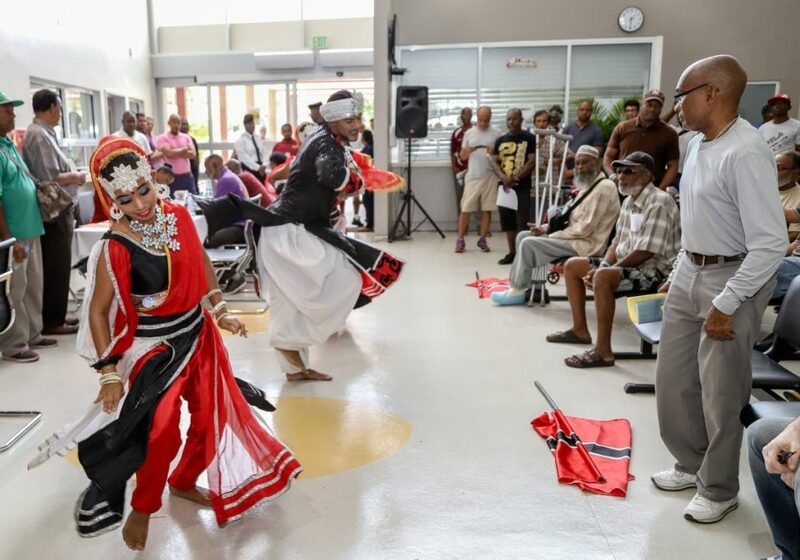 Amritam Shakti Dancers perform at the Men's Wellness Initiative Clinic put on by the Ministry of Health at the Colposcopy Centre in the Mt Hope Women's Hospital yesterday. Deyalsingh dubbed the clinic a "one-stop shop" where participants could get their eyes tested, gain information on the role of lung cancer nurse specialists and be introduced to the fast-track referral system for potential lung cancer patients by the NCRHA Lung Cancer/ Thoracic Malignancy Unit. 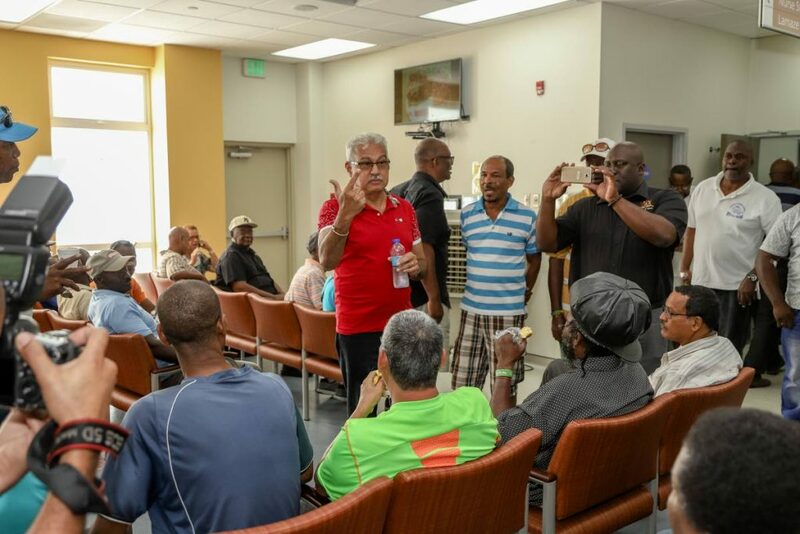 While men waited to be screened there were numerous lectures taking place throughout the building on maintaining a healthy lifestyle, nutrition, type-two diabetes, managing high blood pressure. There were also interactive sessions at various information booths. The National Alcohol and Drug Abuse Prevention Programme (NADAPP) was also present at the clinic giving pertinent simulations to men on the effects of tobacco use over a prolonged period of time which can result in tooth decay, emphysema, stomach ulcers, hearing loss, cataracts, deformed sperm and even cancer. They also advocated the use of the smoking cessation clinic at the Arima Health Facility which is the only functioning public cessation clinic in the country. The smoking cessation clinic started in October, 2012 and, to date, has had over 450 patients most of whom were able to quit smoking or significantly reduce their intake. Tobacco use in Trinidad is at 21.1 per cent and this is one of the root causes of chronic disease. 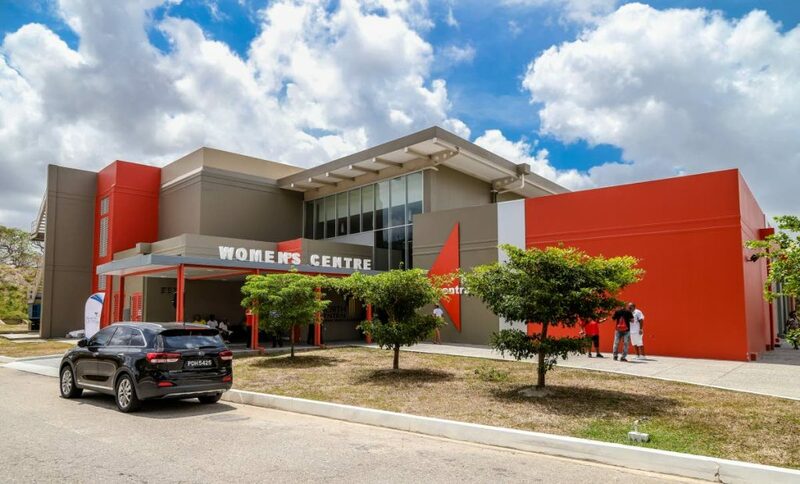 The Women's Centere in Mt Hope. Deyalsingh said, “Due to the overwhelming response we have received we will use this as a pilot to start doing the clinic on a national level with all the regional health authorities involved to have a national men’s day so we can enhance this positive behavior towards men’s health." The five top cancers that cause death in TT in both men and women are: prostate cancer, breast cancer, colorectal/ colon cancer, lung cancer and cervical cancer. The top two for men are: prostate cancer and lung cancer. 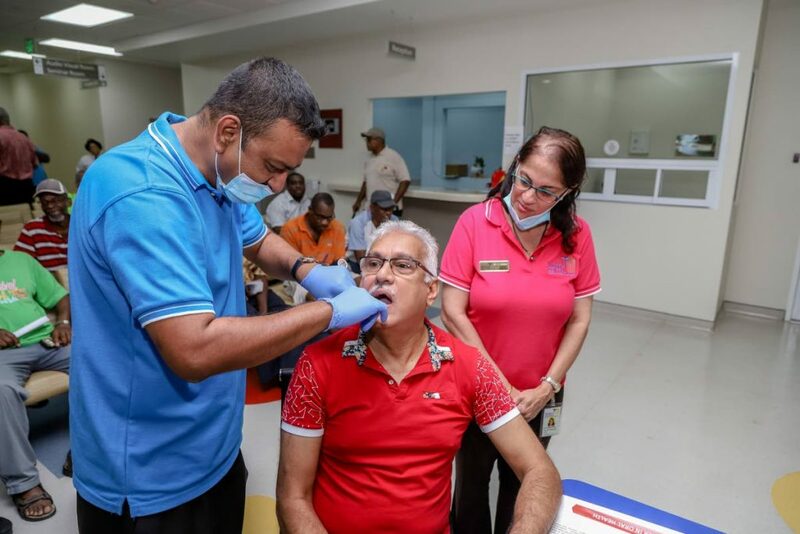 Minister of Health Terrance Delyalsingh, sitting, has a dental screening by Dr Robin Sieuraj, left, as Dr Natasha Kochhar looks on at the Men's Wellness Initiative Clinic put on by the ministry at the Colposcopy Centre in the Mt Hope Women's Hospital, yesterday. However, there are some men who can also get breast cancer. Javis G Sampson Hunte the breastfeeding trainer for clients and staff of the NCRHA gave several presentations to attentive men on male breast self examination and how to do so along with testicular self-examination. In a short interactive session the Deyalsingh spoke with members of public who were quite eager to answer his questions on NCDs which is inclusive of diabetes, hypertension, high cholesterol and cancers. The minister also promoted three ways to reduce the risk of NCDs: exercise for at least 30 minutes daily, have a balanced diet and drink lots of water. Asked by Newsday about the time frame it took for patients to receive their results from prostate screening, the NCRHA CEO Davlin Thomas said,in the past, the procedure would usually take two weeks but now it takes approximately two hours. NCRHA Chairman Steve De Las said, “We have two tiers of persons—the ones who are not at risk from the initial screening and they get their results within a week but for the people at risk we are keeping them one time. You may have noticed congestion and that is because we are retaining men to see the neurologist, so we have the specialist on standby here today. So once a risk is identified they are seeing the specialist immediately because we have the results within two hours. 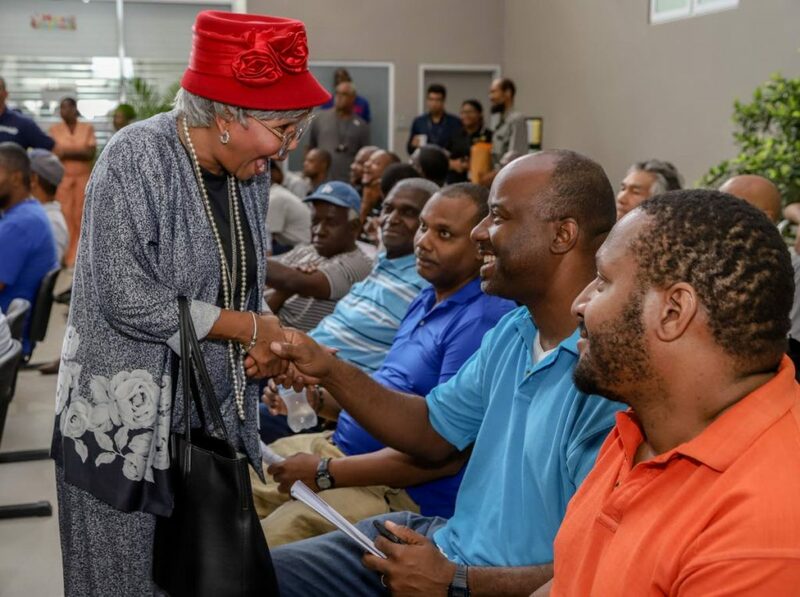 Comedian Nikki "Granny" Crosby was told "that it have men at the Colposcopy Centre" so she came to get a healthy young man as the Ministry of Health hosted a Men's Wellness Initiative Clinic at the Mt Hope Women's Hospital yesterday. Throughout the day there was live entertainment by Nicki Cosby and Amritam Shakti Dance Company among others. Reply to "Afro-Trinidadian males at higher risk of prostate cancer"